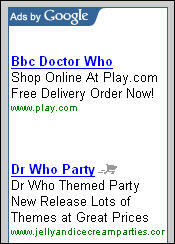 I noticed that Google are promoting Checkout in their Adsense content and it’s in Search Results too. See the images below. This is taken from my whimsical blog WhoTube. I’m a Google Checkout sceptic but it’s difficult not to accept that it’s going to have a major disruptive effect on ecommerce. The sign up deal as it stands just now is compelling: no selling fees and bonuses for buyers. It’s exactly this sort of visibility that makes it a plausible contender despite Google’s lack of expertise and experience in the payments arena. But sellers should exercise caution. The payments business is harder than it looks and PayPal is streets ahead in terms of fraud protections and safety controls. Google checkout is a really interesting one. I could write all night on this. However, I’ll say one thing. To those who say “ah, the goog behemoth will motor all over paypal and drive massive checkout adoption”, I say “Cool. Well in which case, given it’s been around in the US for a year and there is minimal cost to implement, send me a link to an adwords results page showing all US merchants on adwords with the checkout logo next to their ad.” It’s very hard to find as adoption in US has been really poor. To be honest, I’m surprised. Given it must help CTR on your adwords and there are massive incentives for implementing and it’s just a button on checkout so you can get those benefits for free, I don’t understand why google US isn’t littered with the new checkout logo. Maybe I’m just looking in the wrong place. I have lots of other thoughts on this issue, but I am rather waffling on now, so I’ll shut up.